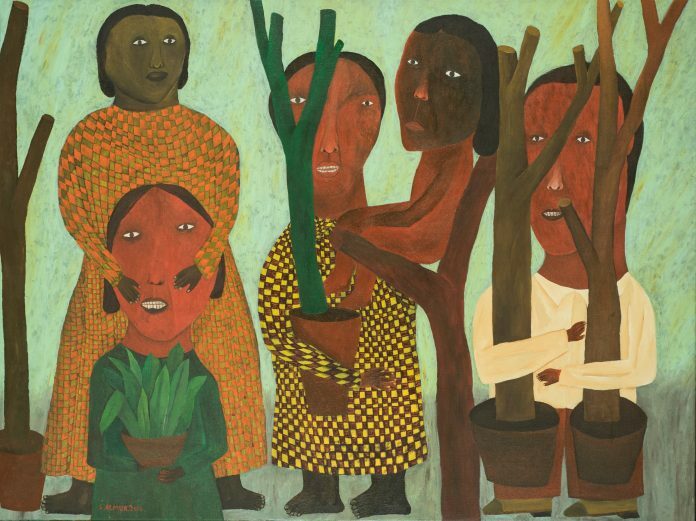 There is currently a burgeoning interest in Modern and Contemporary African Art and SALON at Saatchi Gallery’s latest exhibition – Forests and Spirits: Figurative art from the Khartoum School – provides a unique opportunity to engage with a major force in its development. 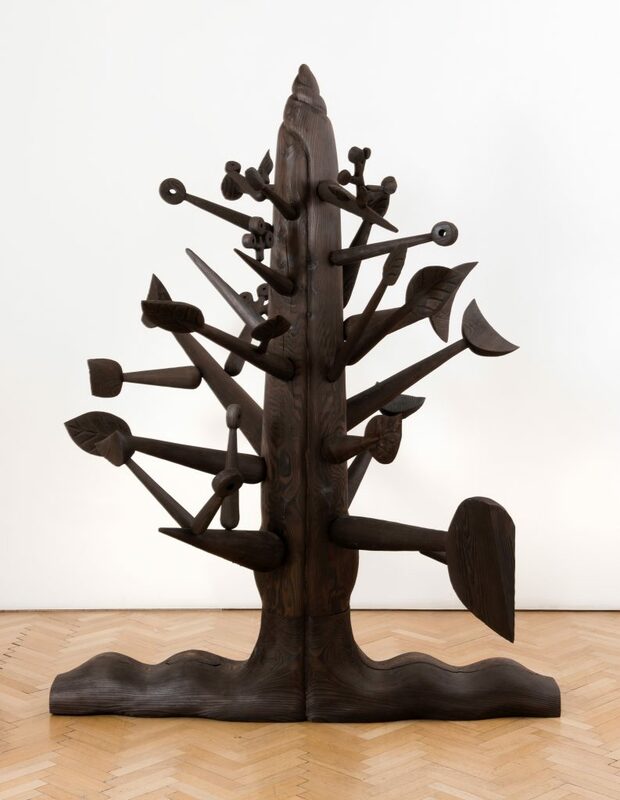 Conceived by Roubi L’Roubi, curator of the Foundation Gallery, and Philippa Adams, Saatchi Gallery’s Director, Forests and Spirits seeks to bring wider attention to contemporary African art, and in particular the enduring influence of the Khartoum School. Formed in the 1960s, the Khartoum School was an art movement centred around the city’s College of Fine and Applied Arts, the institution which has itself been pivotal in the development of contemporary art in Africa. Ishaq and El-Salahi, are among its founders, while Elmur was a pupil in the 1980s when Ishaq, a former graduate, was head of painting. 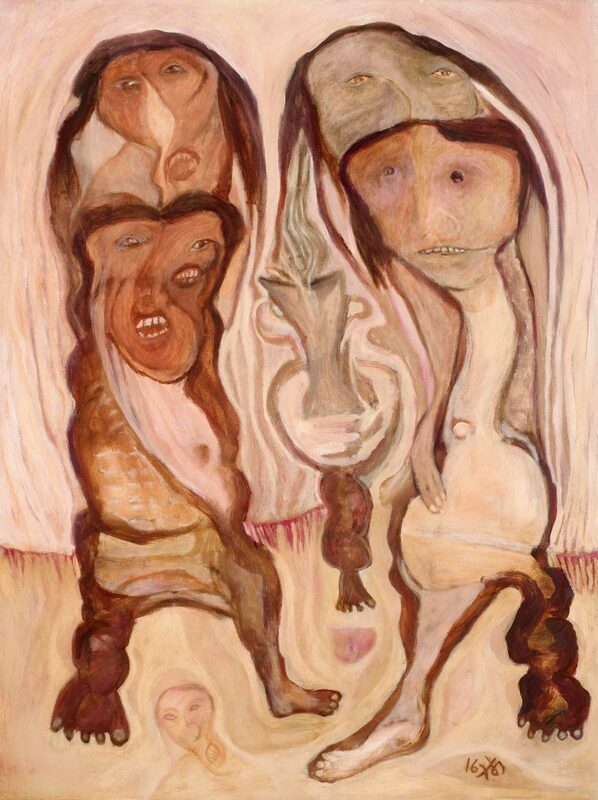 Whilst El-Salahi was the subject of a retrospective at Tate Modern in 2013, this landmark presentation is the first to introduce the work of these three major contemporary African artists to London – and consists of paintings by Elmur and Ishaq, and a new sculpture by El-Salahi. Ishaq and Elmur’s paintings will be displayed around El-Salahi’s Meditation Tree. His first sculpture, the work fulfils the artist’s long-held ambition to render his drawn images in three dimensions and to play with their scale. Trees are a recurring trope in Elmur’s work. Many of the paintings featured in this show are drawn from his celebrated ‘Forest’ series, first seen in his acclaimed 2018 retrospective at the Sharjah Art Museum, UAE. These were inspired by the Sunut Forest, which lies on the junction of the White Nile and Blue Nile at the centre of Khartoum. Ishaq, meanwhile, has long been preoccupied with the cult of Zar, the term for a demon or spirit assumed to possess individuals, mostly women. The ceremony to drive them away is not an exorcism as perceived by Western sensibilities, it typically includes music and dancing and is effectively an exercise in social restraint, as the ‘demon’ is often nothing more than an undesirable personality trait such as rudeness or licentiousness. L’ Roubi is a London-based creative director with a keen interest in contemporary art, and in particular African art. 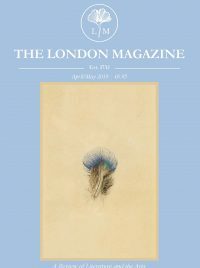 He is also the founder of the The Foundation Gallery, based in London, which provides a platform for communication, creative management for artists and the production of supporting exhibitions. On the occassion of the exhibition we had the chance to discuss the show with L’Roubi in more detail. When did you first discover the Kharthoum School? At an early age in the 1970s through the work of one of the School founders -Ahmed Shibrain. My family were among his patrons and he often visited. His works on paper and ink, as well as oil on canvas combined the tradition of both an African and an Arab artist. The home where I grew up in Khartoum has a beautiful raised garden designed and executed by Shibrain. Other commissions by my family included the villa gates in wrought iron with wood. The artists in the show all trained at the City College of Fine and applied Arts, the institution which has been pivotal in the development of contemporary art in Africa. Kamala Ishaq and Ibrahim El-Salahi are some of the prominent founders of the Khartoum School and Salah Elmur trained under Kamala Ishaq in the 1980’s. Later on, I came across the works of these artists. What drew you to these artists and their works? The figurative and the narrative aspects of the work. Each picture depicts a situation and the human condition in real time. It follows an ancient tradition in African art of story-telling and the drawing out of emotion and the soul. Sudan is uniquely placed in the Arab world. It combines both the Arabic as well as the African heritage. The calligraphy intertwined with forms in works presenting a unique aesthetic. There is a growing interest in African art in all sections of the art world – can you say more about this? To me, the growing interest in African Art derives from the fact that it resonating with our contemporary sensibilities. The narrative and figurative themes draw us in artistically and existentially. It has an authentic naturalness in its conception. Its execution is fresh, pure and confident. What excites you most about the exhibition? Presenting three significant artists to a new audience. The exhibition has a common theme – the tree – which each uses independently – but which are linked via natural and cultural associations. It thrills me to be able to share the works. The sculpture, Meditation Tree by El-Salahi, forms a physical work that brings in the Tree theme within the canvases together. You have a background in fashion– can you talk more about your transition in to art as a Curator? Art has always been part of my upbringing and interest. Fashion is just another form of applied art. Over the past years, I have enjoyed paintings on canvas. I would paint with colours over large canvases as a study of a new palette which I would have wanted to employ in a collection. How do you see the future position of contemporary African Art? I would like to see that the artists and works of African painters is viewed only in terms of the works and non-geographical. Africa has well established schools and colleges. Hopefully the work is seen in the future as simply Contemporary Art. 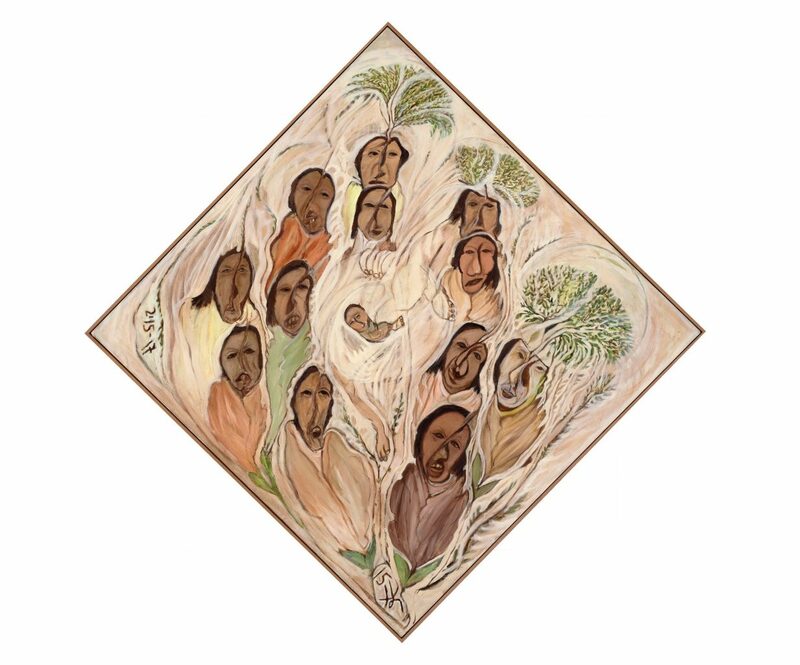 Forests and Spirits: Figurative art from the Khartoum School, curated by Roubi L’ Roubi is on view at SALON at Saatchi Gallery, 28 September – 25 November 2018. For more information, go to the Saatchi Gallery website.